Gourmet Girl Cooks: First Breakfast in the New Kitchen -- I'M BACK!!! I'm so glad you are back! I've missed you! Hi there, Ayla. Welcome back! I don't envy you the moving ... been there, done that a few times ... LOL! But on the other hand, it IS a nice feeling getting a fresh start in a new home, isn't it! I know that you still have lots to do to get settled (a gross understatement, I realize) so take your time getting back into the "swing" of blogging. In the meantime, I didn't run out of recipes while you were away ... N-oooo! Between the old favorites plus all the other ones waiting in the wings, no way was I going to run out! Welcome back - I've missed you! 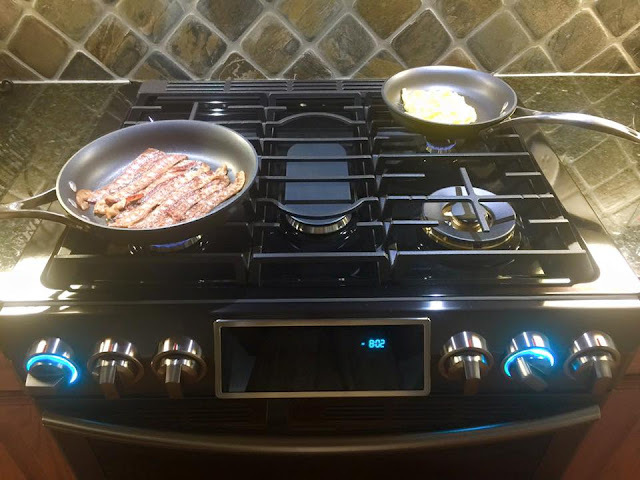 I hope this is the first of many wonderful breakfasts in your new home! Wishing you all the very best settling in and making it your own. We have MISSED you Ayla! Love your new stove and cannot wait until you are settled, rested and ready to send us new ideas to try! You are THE BEST! Yeah! I'm so excited to have you back!! Welcome back! Love the stove. I've been looking for a new recipe for a few weeks, and finally discovered that you were in the process of moving. A new kitchen is a bonus to the move and don't forget you get a shiny clean house to live in - uncluttered! You have INCREDIBLE taste in stoves.....Brand please! Missed ya and hope you and your husband are getting settled in! Welcome back. I enjoy your blog. Is that a Samsung range? I'd love a review as I'm considering one in the future. Thank you for your feedback on the Samsung range. It sounds like a great product.